To pair a Bluetooth® Wireless Technology enabled mobile phone, authentication and connection processes are first required. As a result, you cannot pair your mobile phone while driving the vehicle. First park your vehicle before use. ➀ Search for device names as displayed on your mobile phone and connect. ❈ The device name and passkey will be displayed on the screen for up to 3 minutes. If pairing is not completed within the 3 minutes, the mobile phone pairing process will automatically be canceled. ➂ Pairing completion is displayed. ❈ In some mobile phones, pairing will automatically be followed by connection. ❈ It is possible to pair up to five Bluetooth® Wireless Technology enabled mobile phones. The names of up to 5 paired phones will be displayed. A [►] is displayed in front of the currently connected phone. Select the desired name to setup the selected phone. ➀ Select a mobile phone that is not currently connected. ➁ Connect the selected mobile phone. ➂ Connection completion is displayed. ❈ If a phone is already connected, disconnect the currently connected phone and select a new phone to connect. ➀ Select the currently connected mobile phone. ➁ Disconnect the selected mobile phone. ➂ Disconnection completion is displayed. This is used to change the order (priority) of automatic connection for the paired mobile phones. ➁ From the paired phones, select the phone desired for No.1 priority. ➂ The changed priority sequence is displayed. ❈ Once the connection sequence (priority) is changed, the new no. 1 priority mobile phone will be connected. - When the no. 1 priority cannot be connected: Automatically attempts to connect the most recently connected phone. - Cases when the most recently connected phone cannot be connected: Attempts to connect in the order in which paired phones are listed. - The connected phone will automatically be changed to No. 1 priority. ➀ Select the desired mobile phone. ➁ Delete the selected mobile phone. ➂ Deletion completion is displayed. ❈ When attempting to delete a currently connected phone, the phone is first disconnected. When you delete a mobile phone, the mobile phone contacts will also be erased. For stable Bluetooth® Wireless Technology communication, delete the mobile phone from the audio and also delete the audio from your mobile phone. 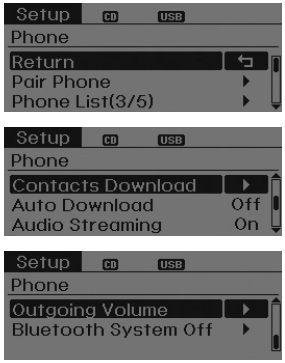 This feature is used to download contacts and call histories into the audio system. The download feature may not be supported in some mobile phones. If a different operation is performed while Contacts are being downloaded, downloading will be discontinued. Contacts already downloaded will be saved. When downloading new Contacts, delete all previously saved Contacts before starting download. When connecting a mobile phone, it is possible to automatically download new Contacts and Call Histories. Songs (files) saved in your Bluetooth® Wireless Technology enabled mobile phone can be played through the audio system. The Bluetooth® Wireless Technology audio streaming feature may not be supported in some mobile phones. This is used to set the volume of your voice as heard by the other party while on a Bluetooth® Wireless Technology enabled handsfree call. ❈ Even while on a call, the volume can be changed by using the key. This feature is used when you do not wish to use the Bluetooth® Wireless Technology system. ❈ If a phone is already connected, disconnect the currently connected phone and turn the Bluetooth® Wireless Technology system off. To use Bluetooth® Wireless Technology when the system is currently off, follow these next steps. ❈ Moves to the screen where Bluetooth® Wireless Technology functions can be used and displays guidance. ➀ A screen asking whether to turn on Bluetooth® Wireless Technology will be displayed. ➁ On the screen, select to turn on Bluetooth® Wireless Technology and display guidance. ❈ If the Bluetooth® Wireless Technology system is turned on, the system will automatically try to connect the most recently connected Bluetooth® Wireless Technology enabled mobile phone. Bluetooth® Wireless Technology connection may become intermittently disconnected in some mobile phones. Follow these next steps to try again. 1) Turn the Bluetooth® Wireless Technology function within the mobile phone ON/OFF and try to connect again. 2) Turn the mobile phone power ON/OFF and try to connect again. 3) Completely remove the mobile phone battery, reboot, and then try to connect again. 5) Delete all paired devices in your mobile phone and the audio system and pair again for use.